It is ironic that one of the most essential of statistical aggregations, the median, has been so difficult in the past to calculate efficiently in SQL. Although the recent window functions provide the solution, there isn't an obviously superior algorithm performance-wise, particularly when working across partitioned sets. Dwain Camps sets the candidates to work and identifies the winners and losers. The median is an important measure to be able to calculate for data, because it underlies the ways we calculate probability. It is difficult to draw valid conclusions from data without being able to calculate the median. In some statistical analyses, the median is a better predictor of the expected value for a set of observations than the mean (average). To calculate the median, in the simplest terms, if you have an odd number (n) of items in an ordered set, the median is the value where (n+1)/2 is the row containing the median value. If there is an even number of rows, the value is the average (mean) of the two values appearing in the n/2 and the 1+n/2 rows. All divisions in this description are integer divisions and standard operator precedence applies. When a set is partitioned it means that one or more columns, when aggregated together, form a group or partition. I’m not sure exactly what got me to thinking about calculating the median in SQL, but it was long ago and I realized almost immediately that this could be quite a challenging assignment. 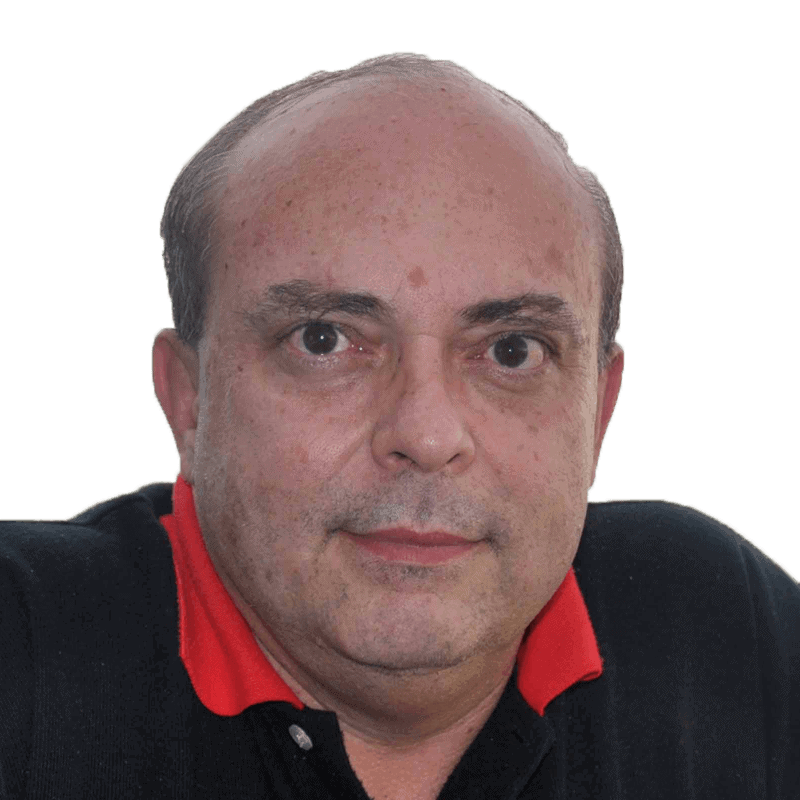 SQL didn’t, at the time, have available any built-in functions for the purpose and I did find quite a few competing solutions out there but no clarity on the performance of the various methods. When I eventually got back to thinking about median, it was mainly because I found that SQL 2012 now offers an analytic function called PERCENTILE_CONT that is capable of calculating the median within a partitioned set when it is passed an argument of 0.5 and the ordering within that set is specified. I decided that I’d try to find the best solution for calculating a median and see how PERCENTILE_CONT compared with other approaches. My initial investigation led me to a page on the StackOverflow web site that listed quite a few competing solutions. Close examination of them identified several that really didn’t work worth a hoot; some even delivering incorrect results, but more importantly it led me to Aaron Bertrand’s article published in August of 2012 entitled: What is the fastest way to calculate the median? Much to my chagrin, he had pretty well covered the topic of performance. However, as Adam Machanic pointed out in a response to Aaron Bertrand’s article, it would be nice to see which solutions proved fastest across partitioned sets, and that was my intent all along! The SQL script below will create and populate a table for testing that each proposed solution returns the correct results set for the median within each partition (ID). We’ve added the non-unique index to include our IDs and values (N) because we expect most solutions will benefit from it. We’ll be testing our solutions with and without this index. The data contains four sets: two with an even number of rows and two with an odd number of rows, each with and without duplicates. We’ve chosen this simple data because it is pretty easy to see by inspection what the correct value for the median is within each partition. It is important to include duplicates because a few of the solutions I examined were failing for that case. My testing methodology is to create or adapt a solution from the non-partitioned sets case, check using the test data above to make sure it generates the correct median value for each set, and then run that code through a 1,000,000 row test harness (described later) to see how it performs vs. a baseline case. To save our readers time, we’ve included only solutions here that did reasonably well in the 1M row test harness and returned correct results. If we take a look at Aaron Bertrand’s article linked above, we see from the performance results that there were two solutions that seemed to provide the best performance in his test cases. These were labelled as 2005_C and 2012_B. In the code below, I have adapted the 2005_C solution to the partitioned sets case and we’ll use this as the baseline for our initial performance test. Note that Aaron Bertrand attributes this solution to SQL MVP Itzik Ben-Gan, but from here on out we’ll refer to it as “Aaron Bertrand’s solution” to give credit to him for reporting on its performance. Try as I might, I was unable to adapt case 2012_B (a paging approach also suggested by Mr. Itzik Ben-Gan) to partitioned sets. Perhaps someone more familiar with using SQL 2012 paging in that way might have more success. A pity too as it was the fastest of all the solutions he tested. I indicated at the beginning that I was interested to see how various solutions compared performance-wise against the new SQL 2012 analytical function PERCENTILE_CONT. In his article, Aaron Bertrand showed quite clearly that it didn’t perform nearly as well as Solution #1. But just to be sure, and for comparative purposes we coded up this solution against our test data. Note that PERCENTILE_CONT is designed to include the partitions’ median value in each row of the subject set, so in order to condense that to just the partitions we need to have a GROUP BY. Clearly the solution is pretty succinct and once you get used to the new syntax, reasonably easy to understand. Using our testing methodology, we ran this solution in our 1M row test harness against the baseline (Solution #1) and tabularized those results with and without the INDEX. The last row of the table (#2 % O/(U) #1) is calculated as 100*(#2 – #1)/#1, making it easy to observe the magnitude of the difference between the solutions. Positive numbers mean #2 is slower than #1. The best case (elapsed time without the INDEX) showed that PERCENTILE_CONT was 24% slower than Solution #1. This verifies the results that Aaron Bertrand published in his article. When I write an article I try to make sure I can contribute something new. Given the plethora of solutions out there for the problem of calculating median, I knew I’d need to use something unusual otherwise anything I come up with would either have already been suggested or be derivative. In the Counts Common Table Expression (CTE), our inner derived query calculates the counts across each partition. From that we calculate c1 (the row number needed for the odd rows case) and c2 when needed for the additional row we need for the even numbered rows case. Finally, we use CROSS APPLY VALUES on c1, c2 to un-pivot them to separate rows, thus creating a table we can CROSS APPLY back to our original table on the partition elements and the calculated row numbers. While it looks complicated, a quick check of the results against the sample data shows that the correct results are generated, and a look at the performance against 1M rows of test data looks promising against our baseline query. In the same response to Aaron Bertrand’s article where he suggested checking cases for calculating medians against partitioned sets, Adam Machanic suggested another solution. I have done my best to adapt the solution he proposed as directly as possible to the partitioned sets case. Since this was not one of the solutions Aaron Bertrand tested, I was curious how it might perform for this case. The results from this query are correct for our four sets case and the performance results from our test with 1M rows look extremely promising. In order to create a 1,000,000 row test harness, we’ll make use of our old and trusted friend the Tally table. In this case, we’ll be CROSS JOINing two sys tables with a ROW_NUMBER() to get 1M rows, but any other Tally table you prefer will do. Note that our test harness only generates “approximately” one million rows. Within the CROSS APPLY, there is a TOP statement that ensures that for successive IDs, we’ll include either an odd or an even number of rows within that partition. This helps to ensure that any solution that is biased either towards even or odd numbers of rows, will be handled fairly. So for each million rows we’re actually about 50 rows short, but that’s close enough for our purposes. Before graphing the performance results, we decided to eliminate those from PERCENTILE_CONT, because at larger row counts that solution tended to obscure the differences between the other results. In all cases, solutions #1, #3 and #4 were faster in both elapsed time and CPU time. 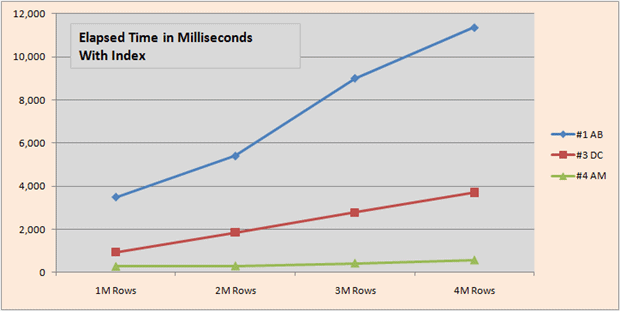 The first graphic compares the elapsed times from 1M to 4M rows, with and without the INDEX. Solutions are numbered as above with author’s initials included (AB=Aaron Bertrand, DC=Dwain Camps and AM=Adam Machanic). I will take this opportunity to apologize to Mr. Bertrand, Mr. Machanic and Mr. Ben-Gan if I’ve adapted their solutions in a different way than they would have preferred. We see that with an INDEX, Adam Machanic’s solution is significantly faster than the others, while without an INDEX my solution manages a slight lead. CPU times tell a similar story to elapsed times, although mine with an index doesn’t trail in CPU time quite as much as it did in elapsed time. All of our performance tests were done in SQL 2008 R2 (64 bit) running on Windows 7 Professional (64 bit) using a Dell Inspiron laptop w-Intel Core i5-2430M @ 2.4 GHz, 8GB RAM. SQL Profiler was used to capture the results of five runs for each row set and Excel was used to calculate from this an average for elapsed and CPU times. We have explored some of the available T-SQL solutions for calculating the statistical median in this article. 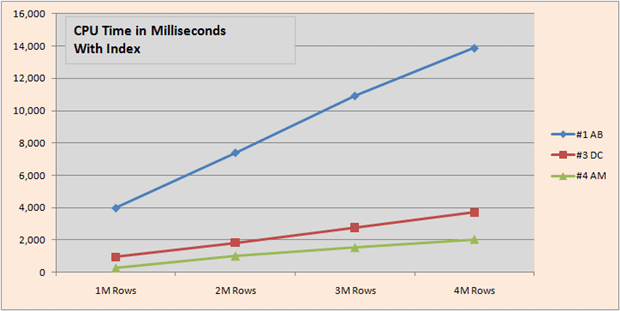 We included the built-in SQL 2012 function in our initial 1M row test, PERCENTILE_CONT but we eliminated it from our final graphic results because it generally does not appear to be a “high performance” solution, as Aaron Bertrand previously showed for the case of sets without partitions. Even though the syntax is new this solution does seem rather simple to understand, so in the rare cases where understandability is more important than performance, it still offers some merit. All solutions provided focus specifically on data that contained partitioned sets. We’ve seen that in the worst case for the solutions we explored in depth, four million data rows partitioned into 100 sets could be processed in about 12 seconds or less, which in my opinion is not too bad. We found that in the case of data that is indexed, Mr. Machanic’s solution was able to rip through that same four million rows in about 0.5 second, which was pretty remarkable. If you have a favorite method to calculate the median that we didn’t cover, please feel free to add it to one of the test harnesses described below. Basic Test Harness for Median.sql – A basic test harness that allows testing against known sets of 1M rows of test data. Profiler Test Harness for Median.sql – Designed for use with SQL Profiler (to run each batch five times), this test harness suppresses the output results from each query. If you find that it is a contender in either elapsed or CPU time, we’d love to hear about it in the comments section below. Do you have the time to test this? PESO! How gratifying to see gurus like you wasting your precious time reading my articles! 🙂 I am particularly happy that you had time to look into Mr. Ben-Gan’s solution on SQL 2012 that I couldn’t get to run. CPU time = 3040 ms, elapsed time = 2119 ms.
CPU time = 842 ms, elapsed time = 864 ms.
CPU time = 203 ms, elapsed time = 211 ms.
CPU time = 171 ms, elapsed time = 175 ms.
CPU time = 156 ms, elapsed time = 148 ms.
CPU time = 2980 ms, elapsed time = 2113 ms.
CPU time = 4696 ms, elapsed time = 1905 ms.
CPU time = 3586 ms, elapsed time = 2975 ms.
CPU time = 4057 ms, elapsed time = 3303 ms.
CPU time = 3495 ms, elapsed time = 3305 ms. I also gave it a try at 4M rows to see how it scales. CPU time = 11105 ms, elapsed time = 10341 ms.
CPU time = 3323 ms, elapsed time = 3328 ms.
CPU time = 1592 ms, elapsed time = 450 ms.
CPU time = 1264 ms, elapsed time = 343 ms.
CPU time = 1372 ms, elapsed time = 390 ms.
CPU time = 11731 ms, elapsed time = 10923 ms.
CPU time = 16692 ms, elapsed time = 9467 ms.
CPU time = 16084 ms, elapsed time = 12720 ms.
CPU time = 16550 ms, elapsed time = 13571 ms.
CPU time = 16101 ms, elapsed time = 13141 ms.
Clearly it scales well too! I forgot to mention, that second solution you posted is now the winning entry in the with INDEX category for elapsed time @1M rows. Don’t have time to run the full profiler testing (to see how it averages out) at the moment. This got me wondering how well my sqlclr Median function would perform compared to all these methods. The Median problem has an interesting history. Back in the early 1990’s, Chris Date and I had dueling magazine columns in the two newsstand database magazines of the day, DBMS and DATABASE PROGRAMMING & DESIGN. They wound up being owned by the same publisher, so we had to do something to assure that both magazines sold. A “feud” is a great way to do this – ever hear of the Jack Benny and Fred Allen Feud on old time radio? For several months, he would propose a median and I would counter with another. The various solutions were discussed in editions of my SQL FOR SMARTIES years later. Thanks for posting. Surprising the CLR didn’t fare so well. Take a look at what PESO provided and tell me that doesn’t rock! Good to hear from you again and Merry Christmas! I like the history lesson. I know this problem goes back a long ways. Maybe not as far back as Jack Benny and Fred Allen (never heard of him but I have heard of Jack), but far enough. Medians – an alternative approach. Great article as usual Dwain. Here’s a viewpoint from left field if performance is important. It requires re-evaluating the misunderstood concept of "accuracy". Now that we have datasets comprising millions and millions of rows and hugely powerful computers to trawl through all those rows in mere seconds, it’s easy to lose sight of what we might be wanting to achieve. What are we going to do with the median once we have it? How accurate does it need to be, to be useful? Before we had the luxury of the processing power we have now, statisticians were able to show that representative sampling gave us usefully "accurate" results at a fraction of the cost of considering every observation in the population. If the median price of a widget is $103.10 and random sampling gives us a median widget price of between $102.20 and $104.05, 99% of the time, then it’s important to know whether that variation makes any difference to the decisions being made on the data. It would be interesting to see whether a random sample of values (say n= 4,000) drawn from the population of 1,000,000 would produce a wildly different median, and whether the overhead of the random sampling [say by abs(checksum(newid()))] would be compensated for by the faster calculation of the median. I would have thought that you could only defend the "accuracy" of a million row median, if you could vouch for the accuracy of the underlying observations. In a lot of circumstances you simply can’t. Unless you can, you’re probably just as well off with a 4,000 row randomly sampled median. It would be an added bonus if turned out to require less processing. I’m wondering if a MEDIAN function will be added to SQL Server now that it contains column store indexes. The arrangement of values within a column store makes an efficient median calculation as a built in function much more viable. Thanks for a great article (and to those following up, especially Peso, nice one). I recently needed medians along with MIN, MAX, COUNT and quartile values for producing data for whisker plots. I wondered how the addition of these extra outputs would affect the choice of approach here. I had to produce a hurried output and I’m not happy with what I did (excuses are available, of course) and it would be great to have a good quality general solution. RE: Medians – an alternative approach. Unfortunately, I not a statistician so I can’t really comment on how much accuracy is enough. You may have a point though. Medians are usually much more important in small sample sets. Unfortunately, I’m not a statistician so I can’t really comment on how much accuracy is enough. You may have a point though. Medians are usually much more important in small sample sets. RE: Medians and column stores. I’m guessing that since they already have PERCENTILE_CONT, they probably won’t add MEDIAN. But who knows (except Microsoft)? I am curious exactly what that Quartile calculation was. Did you use PERCENTILE_CONT(0.25)? Called "Best approaches for grouped median"